Tennessee upset a ranked opponent for the second time this year with a 24-7 win over No. 11 Kentucky at Neyland Stadium. The Vols have now won 17 straight games against Kentucky in Knoxville. Tennessee's defense kept the SEC's leading rusher Benny Snell Jr. at bay and held the Wildcats to just 68 yards of total offense in the first half, 262 total yards on the night. Darrell Taylor had a season-high four sacks including a strip sack in the fourth quarter. The school record is 4.5 sacks held by Corey Miller at Kentucky in 2013. Marquill Osborne had two interceptions in the fourth quarter as well. A touchdown pass to Marquez Callaway on the final play of the first half gave Tennessee a 17-0 lead and a big boost of momentum heading into halftime. A 59-yard reverse run by Jordan Murphy put Tennessee is scoring position and a touchdown pass to Dominick Wood-Anderson capped of an 8-play, 85-yard drive in the third quarter. 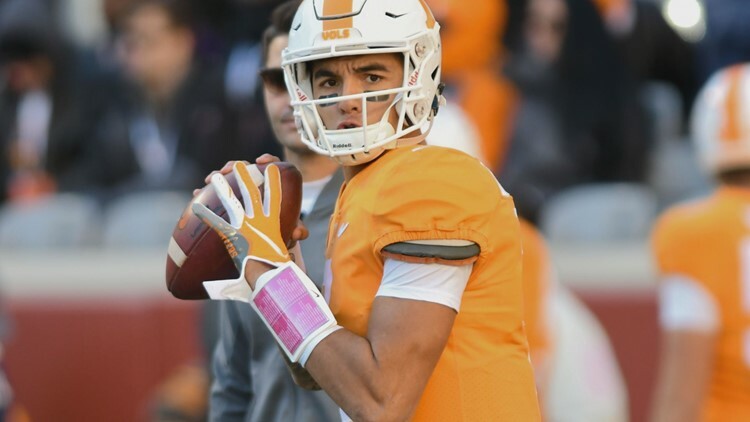 Jarrett Guarantano threw his 144th pass without an interception before the final frame which set a new school record. Former Tennessee quarterback Casey Clausen previously held the record with 143 passes. Kentucky's lone score came in the third quarter. Terry Wilson threw a 19-yard pass to C.J. Conrad. They were 0-2 in field goal attempts including one that was blocked by Shy Tuttle. For the second year in a row, every player was assessed an unsportsmanlike conduct penalty after the two teams got into a scuffle following Tim Jordan's touchdown in the first half. Had any player received an unsportsmanlike conduct penalty afterward, they would have been ejected from the game. The win had major post-season implications. Tennessee now only needs to win one of their final two games against Missouri and Vanderbilt to secure a bid to a bowl game.